Abarth 595 is where it all begins, the starting point for those who want to enter into the world of Abarth. 1.4 Turbo T-Jet with 145 HP, Tourque Transfer Control and Sport Mode as standard, finished with satin chrome detailing. It is time to start having fun. A redesigned front and enlarged air intake allows for even greater engine cooling (+18% of cooling efficiency). This allows for more consistant and stable performance. The new rear diffuser can be customised with three colour packs: white, red and black - Make your Abarth yours. Leather steering wheel, body coloured dashboard with new satin chrome trim and Abarth sports seats, each element highlight the performance of the New Abarth 595. Style: Granturismo 17’’ alloy wheels and black brake calipers, dual chromed steel exhaust tailpipes and satin chrome mirror covers. Performance: 1.4 Turbo T-Jet 165 HP with Garret turbo and Abarth rear shocks by Koni. 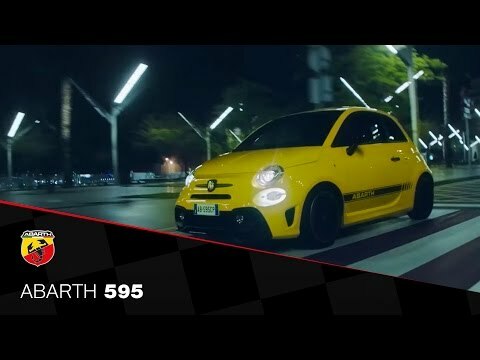 The Abarth 595 Competizione pushes performance to the limit. 180 HP of pure adrenaline with Garrett turbo, Abarth front and rear shock absorbers by Koni, dual mode “Record Monza” exhaust system with 4 tailpipes, fixed 4-piston front calipers by Brembo, Corsa 17” diamond cut alloy wheels, Abarth side stripe in Anthracite Grey. An Abarth with no compromises.